The introduction of UFS 2.0 memory to Samsung's high-end mobile devices - at the time, we could only speculate it was the Galaxy S6 and Galaxy S6 edge - certainly piqued our interest. There was no way those speed improvements wouldn't impact their performance across all usage scenarios - especially when it comes down to app and file load times! Add to these the 3 GB of top-notch DDR4 RAM, and we just might have a winner. That is why, at MWC 2015, we managed to pit a pre-release Galaxy S6 edge against Apple's iPhone 6 with its blazing A8 chipset and tight software optimization. While the Exynos 7420 in the Galaxy S6 edge kills it in the multicore benchies, the A8 is still on top when it comes to one-on-one processor core power, at least in synthetic tests. What we tested, however, is real-life experience when it comes to opening the most used stock apps on a phone, like the contacts, messaging, camera and so on, with their app loading times directly on display. 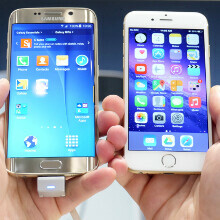 As you can see in the video below, the two phones are almost neck-and-neck when it comes to app launching speeds, which is more of a tribute to the top-shelf RAM and storage tech in the S6 edge, since Samsung's TouchWiz overlay is usually quite heavy to push around, especially on a Quad HD display like the one in the S6 edge. What do you think, does it seem like a tie to you? All i see is Samsungs Fully Featured contacts app with detailed Pictures and menus VS Black And white contacts app on Iphone . My 3310 has better contacts app and can open it faster. Samsung impoving this much I almost couldn't except it. While I love the improvement, and certain do notice it, I still wish touchwiz just completely vanished. The features touchwiz offers are INCREDIBLE. However, it really holds back the power of Samsung phones. Like the Author said, the UI feels heavy at times. But all in all, I think Samsung is understanding what improvements need to be made. Every reviewer has said exactly the opposite of what I said? Not true. Especially considering some of what I stated is in the article above. Completely vanish? Stock is blazing fast but it's boring as fock. You gotta xposed the heck outta stock to make it close to touchwiz. Why don't everyone get that touchwiz was sluggish at times because it was busting at the seams with features that even lollipop still doesn't have. Face it you'll always have options for aosp android. But Samsung flagships are not among them. Lol stock isn't that boring. I did fine using that with my nexus 5. But you're probably right, it's a matter of preference. But I just hate that touchwiz limits the beasts that use it. My note 4 was only blazing fast for me after making tweaks around touchwiz. You sir are absolutely correct. It pretty much boils down to preference. I will also admit that I did have to spruce it up a bit. But TW on Note 4 and S6 is fantastic. When I had Note 3. I used both Touchwiz and AOSP Roms. AOSP was always very very fast. Like M8 fast. But Touchwiz has tons of stuff I always had to come back for. Like video codecs, working WiFi direct, floating videos, s pen functionality, one handed mode and on and on. Hi. Can you please advise what are these TW tweaks you did. I would love to do the same on my Note 4 :). Thanks. LebronJamesFanboy it's called loading another launcher. If you don't like touchwiz. It's just that easy. But if you actually used Android in the first place then you would know this. Dude, if you have to say all that, it just proves that spec don't mean nothing. It's about real world experience. You are splitting hairs at this point. Well we can see the speed , at this point it no longer matters. What matters now is real life expirience you are talking about. And id rather have fully blown contacts phone app that has contacts pics and tons of other features with ease of use than have sketchbook black and white text as my contacts app. That's subjective. I would rather look at the black and white text. I prefer the simpler layout. However, my gf would definately prefer the other. But enough with comparing which app is better. Let's agree both phones are just as fast in the test and be done. Wrong. Both phones are not just as fast. The S6 has the fastest 3 GB 1552 Mhz DDR4 ram used on any mobile device, instead of the iPhones 1 GB 800 Mhz DDR3 ram. The S6 also has the fastest emmc 5.1 storage. Plus the 64 bit octa core running at 2.1 Ghz is superior to the dual core 1.4 Ghz CPU. But since specs don't matter to you iFools. Then what about real multitasking or multi-windows support. Oh, that's right you can't experience any of that since you don't have real multitasking or multi-windows support. I guess you have to experience it though. I wonder if that's why Apple is putting 2 GB of ram in their next model iPhone 6s? I'm still trying to figure out where Nick found "lag" on the very first test. I wonder how the Samsung haters are going to react when the S6 matches/excels the 6 in speed. No offense, but the S6 should pretty much destroy the 6-month old iPhone 6. Also, do yourself a favor and care less about what Samsung haters think. Also, the very slight lag/delay has been a common touchwiz issue for a long time now in terms of opening apps, but it does look like it's improving. . But hey, from the looks of the video the Galaxy 6 edge bested the iPhone in terms of returning to the home screen. What the f**k are you looking at? The S6 opened the apps faster than the iPhone 6 did. 1. Was the use of profanity really necessary? 2. Obviously, if you watched the video, there was no clear winner in terms of opening the apps. @Lebron You are seriously needed on this blog. Some people are so driven by their bias that they can't even think straight. I hate Apple with a passion, but even I can admit that the phones are just as fast. A delay in opening an app in IPhone is loading and transition effect, but in Samsung it's a lag. I can't see the lag either? And most of the times when iPhone won it's because of the needlessly long animations on the GS6. Regardless, it's great to see Samsung getting back on track. Where Samsung dominates for half a year then Apple the next (I assume). iphon looks so ancient next to edge.. but doesn't nxt to horrible S6 anyway only STUPID will do such comparsion .. like which will open app faster jeesus christ! No, the iPhone 6 does not look ancient next to the S6, just because it has curves glass... I'm a Note 4 user, but the iPhone 6 plus is better looking. The reason I own the Note is that I choose substance over style. If Android would run on an iPhone, I would never buy anything else. The iPhone 6/6+ look like dogs**t. The S6 Edge is the best-looking smartphone I've ever seen, and this is coming from someone critical of Samsung's designs. No need to fap over Apple's garbage design skills. LOL funny you mention "garbage design skills" because even as an avid Samsung fan for over 10 years , Samsung copied the bottom of the iPhone completely besides repositioning the microphone. You're trying way too hard to earn those green thumbs you fool. http://www.gsmnation.com/blog/wp-content/uploads/2013/01/1.-Samsung-Ativ-S-Review-Image-Courtesy-Anand-Tech.jpg GG Apple, copying Samsung's design. Wow look at that!! If Apple come out and try to sue Samsung over the S6, I think they'll have massive issues.. I'm surprised Samsung haven't said anything about the striking resemblance to the Ativ!